Cyclone Debbie: Why was aftermath deadlier than storm itself? In Australia, a land of wild extremes, recent flooding caused by Cyclone Debbie has killed at least six people, including a mother who drowned beside her two young children when their car veered into a swollen river. Natural disaster consequences can be unpredictable. When Debbie, a category four system, slammed into the Queensland coast 11 days ago, remarkably there were no fatalities in its immediate aftermath and few serious injuries were reported. 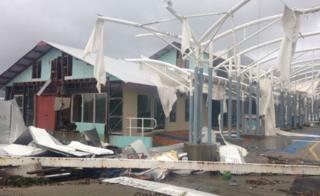 Through flying debris unleashed by violent winds that wrecked homes and businesses, communities around the Whitsunday holiday region felt the full force of what was labelled a "monster" cyclone. At its worst, gusts were recorded at 263km/h (163 mph). But residents and tourists had been told what was coming. Crucially, the slow-moving storm had given authorities time to trigger emergency plans and issue repeated warnings. Thousands of people heeded advice to leave, while others hunkered down and waited. "There is a degree of luck about these big cyclones," explained Richard Thornton, head of the Bushfire and Natural Hazards Cooperative Research Centre (BNHCRC). "This one and cyclones Yasi (2011) and Larry (2006) basically missed the really big populated areas. If the cyclone had gone into Townsville or [made] a direct hit on to Cairns, we would see much bigger damage and much bigger loss of life." Each year, Australia experiences natural disasters including storms, bushfires, floods, landslides and minor earthquakes. Tropical Australia typically experiences about five cyclones, usually between November and April. Although an accepted part of life in the nation's north, cyclones can be brutal and surprise communities. On Christmas Day in 1974, Cyclone Tracy passed directly over Darwin. Records show about 66 people were killed, while iconic images captured a city in ruins. At least 90% of homes in the Northern Territory capital were destroyed or badly damaged. Of course, many lessons were learnt. Houses built in storm-prone areas of the Northern Territory since 1975 should be designed to withstand a category four cyclone. But vulnerabilities have also been exposed more recently. In February 2009, the Black Saturday disaster killed 173 people near Melbourne, highlighting Australia's terrible relationship with fire. A royal commission, the country's highest form of inquiry, would later recommend sweeping changes to the way officials prepared for and responded to emergencies. Despite the ongoing threat of bushfires, BNHCRC research has shown that many Australians either don't properly prepare, or have an emergency plan that is "pretty flaky at times", according to Mr Thornton. "We know we will have another cyclone like Debbie or we'll have another day as bad as Black Saturday, so what do we need to do to prepare for those inevitable events?" he said. "We can't do very much about the event itself, but we can do something about what the consequences of that event might be." "The majority of people who die in floods drive into flooded streams and rivers, so we have got to change some of that risk-taking behaviour," Mr Thornton said. Only a day after Cyclone Debbie made landfall, Queensland's Fire and Emergency Services Commissioner, Katarina Carroll, said her "biggest concern" was people getting trapped in floodwaters. 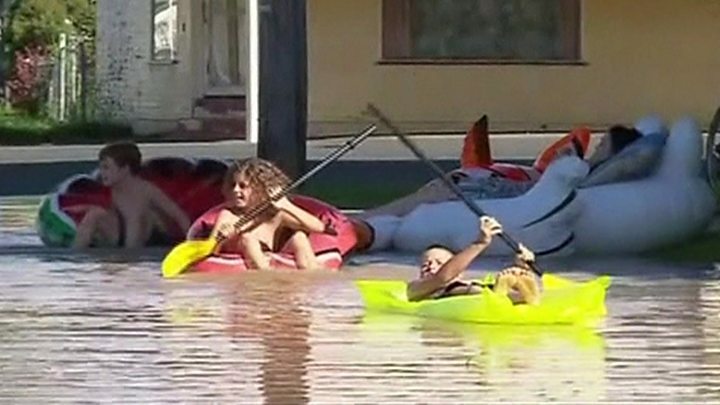 A week later, floods had claimed at least six lives as the storm lashed a 1,200km (745 miles) stretch of coast down to northern New South Wales. Preparation and information invariably save lives when fires rage, levees burst banks or a storm advances. The Australian Institute for Disaster Resilience recently launched a new "knowledge hub" to help Australians prepare for the worst. "Complacency is a killer," said John Bates, the institute's director. "The challenge with major natural hazards and disasters is that people remember them in the immediate aftermath of an event and as time goes on they tend to forget sometimes what it was like." He said people should not rely on government agencies and emergency response organisations to look after them all the time. "Individuals need to be prepared for and expect there will be periods of time where they will need to support themselves," he told the BBC. "You can't expect someone else to do it for you." Bob Cooper, an outback survival instructor based near Perth, recommends meticulous preparation for residents staring at potential disaster. "Underestimating the force of nature is the biggest mistake most people make," he explained. "People make decisions based on their emotions, not on their knowledge. People will attempt to do deep-water crossings in fast-flowing water [having] never done it before, and have got no idea what they are doing and turn a mishap into a tragedy." As flooding caused by the remnants of Cyclone Debbie continues to menace communities, including the Queensland city of Rockhampton and New Zealand's North Island, counsellors say the storm has left many people needing "psychological first aid". Reverend Dr Stephen Robinson, the Uniting Church's national disaster recovery officer, is one person helping those left feeling vulnerable. "One of the most important things is to be able to help to calm people very early on in the process," he said. "With climate change we are seeing increased ferocity and frequency of these sorts of events. That is not going to go away. Where people are affected multiple times they you get this more endemic psychological stresses that don't recover."